And Mother Makes Three and Five DVD box set. This 8 dvd set contains the complete series of And Mother Makes Three, and also the complete series of And Mother Makes Five. DELIVERED FREE IN THE UK. And Mother Makes Three was an early hit for BAFTA-winning comedienne Wendy Craig (Butterflies, Not in Front of the Children), playing an harassed, single mother trying her best to bring up her two very challenging sons. Very innocently, widow Sally Harrison makes a habit of putting her foot in it - in fact, both feet, right up to her neck! Amazingly she always manages to win through in the end, but not before dealing with a bundle of problems involving sons Simon and Peter, Auntie Flo, her boss Mr. Campbell, and the new man in her life - book expert and widower David Redway. 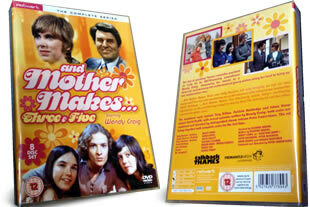 ...And Mother Makes Three first aired between 1971 and 1973. And Mother Makes Five is the sequel series. Sally's ongoing burdens, with her scatterbrains mum and her boisterous teenager sons Simon and Peter now sharing a home with antique bookseller David and his daughter Jane. This Dvd set brings together for the first time both complete series in one box set.